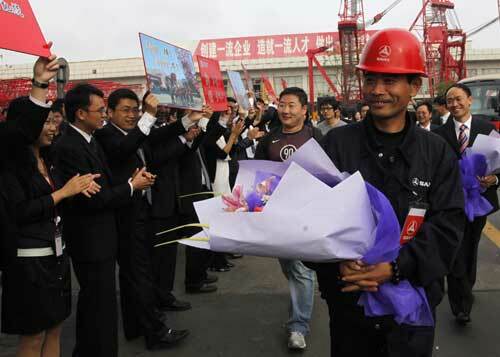 SHANGHAI - Wearing his signature dark blue uniform and red helmet - the same one he wore when he first went to Chile 20 months ago - Hao Heng returned to Shanghai on Tuesday with his mission to help save trapped Chilean miners accomplished. Now he has become a hero both in Chile and China. When he finally arrived after 30 hours of flight, the 36-year-old engineer from Hunan-based Shanghai SANY Science & Technology Co Ltd held a thank-you letter from the Chilean government and stood in front of a welcoming crowd. "At the rescue site, the most beautiful, magnificent and sophisticated equipment came from China's SANY, and I'm proud that I was the only Asian face in the Chilean accident rescue," Hao told the press. A copper mine collapsed on Aug 5 in northern Chile, trapping 33 miners underground. Three crane companies bid for the rescue project, and SANY beat the other two foreign rivals with its high quality and recommendation from local partners. "SANY's crane crawler SCC4000 was selected to be the major rescue machine," said Hao, service manager from the SANY Chile subsidiary. He joined the rescue as a service engineer in charge of the standby hoisting work in the rescue operation. Ever since it was announced that SANY's product would be the rescue machine, Hao's photos and profile have appeared on the Internet. Now many Chilean people recognize his face. "One day, we went to buy special rescue shoes. The footwear shop owner recognized Hao and chased us for more than 20 meters to give us two boxes of chocolates to express his thanks," said Zhang Zhongke, general manager of SANY Overseas. Although SANY's machine became the first backup plan during the final rescue process, Hao still stood by at the site to give his support. During the rescue, he constantly updated his blog and micro blog with words and pictures, becoming an important channel for Chinese netizens to learn about the rescue. "Although it wasn't my obligation to be on the site, I felt responsible as part of the rescue team," he stressed. Hao said he felt relief when he saw miners rise to the surface and hug their families. "We can learn a lot from Chile's rescue work because China has many mines," he said. According to Hao, Chile's rescue victory is twofold: one is the complete and scientific underground equipment and food supply, the other is the organized self-support among trapped miners. "Chile's mine tunnels are big enough for cars to drive in, and there is a food and water supply in every section of the tunnel for urgent use. That is why they could be saved after being trapped for 69 days," Hao said. A Shandong native, Hao graduated from Shanghai Maritime University and joined SANY in 2007. In February 2009 he was transferred to SANY's Chile office thanks to his excellent performance. "Chilean people found my Chinese name very difficult to remember, so when they asked my name, I said 'China, SANY'. In this sense, it equals my name," Hao said with pride.